A true “next level” optic, whether called upon for close-quarters engagements or targets at extended ranges, the new BLACK FORCE100 1-6x24 brings a broader range of magnifications, new reticle design and increased ergonomics to your MSR platform. 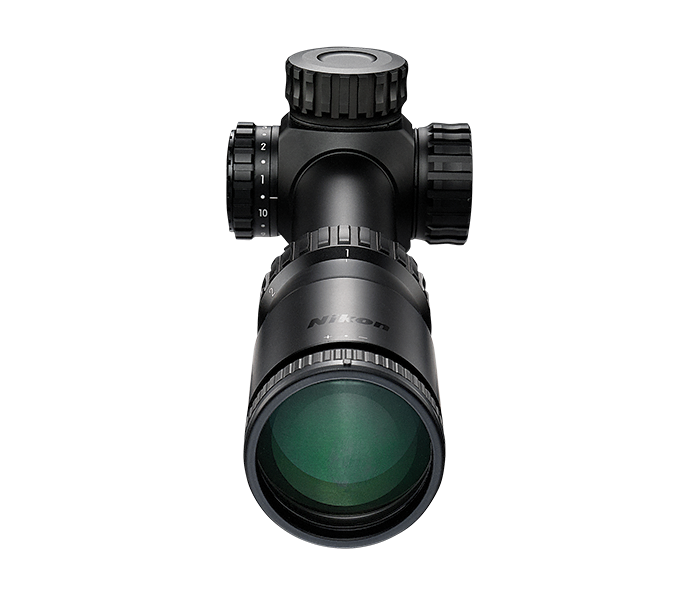 Through Nikon’s Glass First engineering principle, the true 1x to 6x optical system of the BLACK FORCE100 was created to facilitate distortion-free targeting with both eyes open at low power, and aiming precision for extended ranges when cranked up to 6x. An all-new FORCE-MOA reticle combines speed with precision through its illuminated red dot that draws your eye toward the center and MOA-based hash mark design for extended range holdovers or hold-offs for wind. Low profile, capped turrets and one-piece 30mm main body tube assure extreme durability and sighting confidence under tough conditions. The FORCE-MOA is a multi-function, glass-etched reticle designed to enable continuous momentum shooting from target to target, and thus excels in close-to-medium range engagements. When the riflescope is set at its lowest 1x magnification, the reticle’s illuminated center dot serves as a quick reference for centering on the target with both eyes open, similar to a red dot sight. At 6x, the reticle’s lower hash marks provide hold-off points for wind and holdover points for longer known ranges as determined through the calculations of your ballistic table or app. This Illuminated reticle with side-mounted control offers 10 intensity levels of red illumination with OFF switch between each step for quick, easy brightness adjustments. Auto shutoff after two hours of non-operation. One-piece 30mm main body tube assures extreme durability, minimum weight and sighting confidence under tough conditions. The BLACK FORCE100 riflescope features low profile, ¼-MOA turrets protected by sturdy aluminum caps and single screw zero-reset to allow for fast zeroing of the turret after sight-ins. Illuminated reticle with side-mounted control offers 10 intensity levels of red illumination, with OFF switch between each step, for quick, easy brightness adjustments. Auto shutoff after two hours of non-operation. Metal construction for trouble-free rotation and rugged performance with generous eye relief, to help you get on target quickly.